Moisture-sensitive edibles like cereal and coffee grains must be kept free from the air in order to preserve their odor and flavor. A vacuum sealer not only helps in keeping moisture-sensitive food unscathed against air but also helps minimize food wastage. Additionally, freezing food for prolonged periods is a piece of cake with vacuum sealers. Though they have been in the market only for a short time, many different models have already emerged. Below mentioned is a list of the best 4 vacuum sealers currently available that can help you retain the freshness of food easily. Other than supporting a super space saving design, FoodSaver 4840 2-in-1allows you to stock fish and meat for months using its warmth seal mode. This FoodSaver vacuum sealer packages any food item with an impenetrable seal, making the eatable inaccessible to harmful bacteria that cause food decay. The coveted kitchen gadget provides a retractable handheld sealer for sealing items that need to be consumed within a short period. Being compact, and featuring an easy to control sealing system, Nesco VS-02 is a great vacuum sealer option. It supports a very simple build and small size. Resultantly, you can place Nesco VS-02 on top of your refrigerator and use it there without any hassle. Delivering on eye appeal, the unit comes in modern silver and black hues. Hence, it is a welcome addition to most kitchen décors. In addition to the easy, one-click operation system, the unit comes with a special setting to seal sensitive eatables and food items cautiously. Air is sucked out by the Seal-a-Meal FSSMSL0160-000 from a plastic storage bag to make the food storable for a long time. The unit comes with varying Seal-a-Meal bags, each of which is strong, sturdy, and protected against freezer burns. Sealed food by the Seal-a-Meal vacuum sealer can be placed in a microwave or boiling water to defrost and enjoy later. Seal indicator lights, press and hold release and compact design is some exclusive features of the vacuum sealer. However, the best thing about Seal-a-Meal FSSMSL0160-000 is its price tag. So, you need not burn a hole in your pocket to fetch the vacuum sealer. Flaunting the patented CurshFree Instant Seal technology, FoodSaver V2244 helps in keeping any type of food safe from air and harmful bacteria. The unit is able to keep mixed foods, such as leftovers from last meal edible for longer periods. 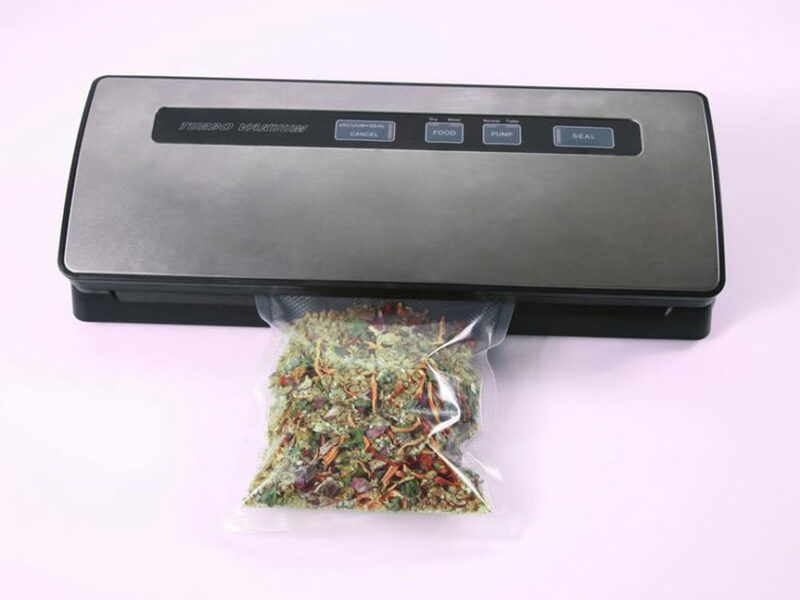 The FoodSaver vacuum sealer comes with several bags in varied sizes to preserve the taste and smell of any kind of food. Some other features brought to your service by this kitchen appliance include freezer burn reduction, inbuilt bag cutter, alternate sealing times, and an automatic turn off mode.